Today you are three. What a wonderful, crazy three years it has been with you. And I have loved every beautiful moment. Between you and me, pal, this has been a weird three years. God has totally changed the trajectory of my life, and I’ve had to do a lot more praying and surrendering than I ever expected – which I think is exactly why God changed the trajectory of my life. Most of the changes have been hard and have required me to let go of a lot of expectations and pride, and have forced me to really look at myself and the kind of person I want to be in the world. And while I like the person these changes have sharpened me into, I’d be lying if I said I have enjoyed every minute of the process. Changing is often hard, and while it’s so good most of the time, it is not always a heck of a lot of fun. That is, of course, except when it comes to you. 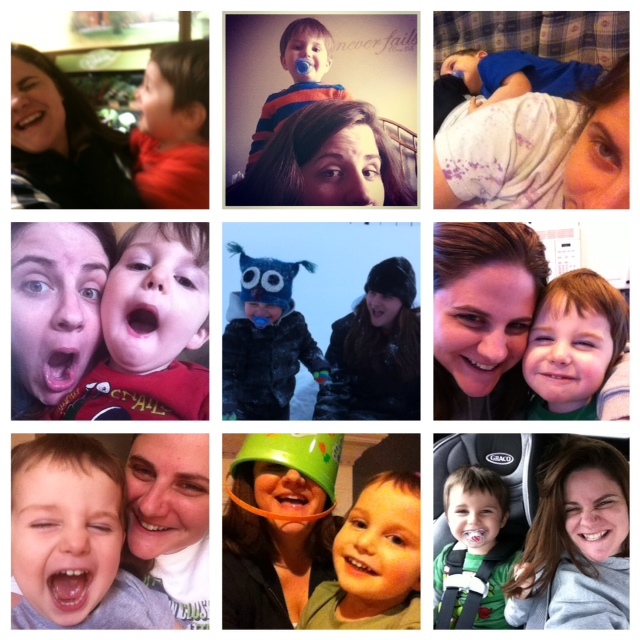 Three years ago in the midst of all of the changes, I also became your aunt…and it has been the most fun. There is nothing about you, kid, that I don’t adore. You are sweet and funny, and you love your people. You like to laugh, and you like to make your people laugh. I think because of that, you’re in the center of my best memories – stomping in snow piles, and splashing in puddles, and building forts out of the couch cushions; reading books, and throwing pom-poms, and watching Curious George on endless loop; eating chicken fingers and pizza and grapes, all dipped in ketchup. I love getting hugged around the knees when I walk through the front door, and hugged around the neck when I leave. And I really love that sometimes you don’t want me to leave at all. I love when pull me into the living room just to sit on the floor next to you while you play with your toys. Because I love that that’s enough for you, just to have your people in your space. I love that at three years old that is a comfort to you. I love it because at thirty-one years old having you and your people in my space is a comfort to me. For your birthday this year, I got you a book about a little blue truck that gets stuck in the mud and is pulled to safety by his little barnyard friends. I got it for you because it’s a sweet story, and because it’s a true one. I got it for you because even at three year old I think it’s important that you know that sometimes the only way you get un-stuck is when people love you enough to pull you out. And without a doubt, for decades now, that’s who your mom and dad have been for me. That’s who Mimi and Poppy have been, and Nana and Boppa, and Aunt Beth, and Aunt Amy and Uncle Mike and Abby, and Aunt Megan. They’re the friends who help me get un-stuck. As you grow up, I pray that they’re the people who help you get un-stuck too. I pray that you see that in them – that they’re on your team, that they’re for you, and that this is true even when you find yourself in trouble; and that this doesn’t change when you’re a teenager or an adult. They’re people who hang in with unwavering support and love and grace. They love an awful lot like Jesus. There is nothing about your family that I don’t adore. But, I also pray that you find some friends from other barnyards. For your family, I’m a little duck that wandered in under the fence twenty-years ago and liked their pond so much that I never left. Now, I think we all forget that it’s not really my pond because I’m just part of the flock. I pray you know what it’s like to experience this on your own – that you know what it’s like to just have friends who show up to help get you out of life’s messes; that you know what it’s like to have the line between friend and family get blurry; that maybe you share your pond with another little duck who needs a soft place to land; that maybe you find a pond that you can land in too. Because today, buddy, you are three. And you should be celebrated for all your three-year-oldness. You should be celebrated today because you’ll only wear green shirts, and because you’re favorite toys are pom-poms and bubble wrap, and because you think Wall-E is the funniest movie ever. Because you want to sit on your mom’s lap and read books, and you think that makes for a pretty great fifteen minutes. Because you giggle so hard when your dad picks you up over his head and turns you upside down over his shoulder before dropping you onto the couch. Because you don’t want your hair washed, but you think it’s great when people sniff the back of your head when you get out of the bath tub and kiss your clean neck before you go to bed. Because you confuse your pronouns, but can say “pomegranate” like it’s no big thing. Because it makes you so happy to share food, especially when it’s a special treat like M&Ms or fruit snacks. Because you love your people so hard and so unashamedly. Three is a very special age, and you are very special three-year-old. It was our second date and we’d decided on dinner at a local pub. We were aiming for casual, a place we could wear jeans and not worry too much about impressing each other. We wanted good food and the football game on the TV. We wanted to feel comfortable, because the whole point in dating is to get to know each other, to see what you have in common, and even (*gasp*) to have a little fun. They suggested a restaurant down the road from the pub, a fancier place that was more dimly lit with a more interesting menu. “It’s better for a date,” they said. My friends, they meant well. They consistently want the best for me, and that appears to be true in even the places that I eat. They wanted me to have a good date, which means they wanted to make sure I had a good time, that I was treated well, that I put my best foot forward. And all those things happened…at the pub. I believe deeply in the good that comes when you live your life in a community of people who love you and have your back. I believe deeply that it’s one of the ways that God loves us and has our backs. But, one of the problems of community is that their voices often get loud. They often get so loud you can hear them even when they’re not around. Most of the time, believe me, this is good. Because they’re the voices that echo Jesus, the ones that remind you that God’s business is making good out of bad, or that God is faithful even when we are not, that rest is okay. They’re the voices that encourage you to keep going even when you feel wonky and scared and vulnerable. They’re the voices that will shut up and listen when they know you already know all the things they want to tell you. Most of the time, their input and suggestions and counsel are worth heeding because they’re people who love you and have your back. Sometimes though, even when your community loves you and has your back and wants only for you to have a good date, the voice that matters is your own. I knew he was coming home from the beach and would be casually dressed. I knew that I was most comfortable in a place I could wear my favorite jeans, hole in the knee and all. I knew that the food was good, and we’d both be cool watching the pre-season football game if the conversation lulled. And I knew, quite frankly, that I just wanted to go to the pub. Because here’s the thing, I’m thirty now. I’ve been dating for more than a decade. I’ve been on good dates and bad dates, and the mediocre dates that fall in between. I’ve worried for so long about impressing the guy that I’ve debated about what to wear for more hours than were necessary, and I’ve remained silent when I should have spoken up about things that concerned me, and I’ve not at all been relaxed in the whole dating process. See? Good voices. Voices that love you and have your back. She’s right, of course. I mean, jury’s still out on the “living your life well” bit, but I don’t think I’m doing a terrible job. However, I have been doing a terrible job of dating, and it is my life, and it is time to do what I want. Or at least, it’s time to start really giving some weight to what I want. I worry too much though, that is my down fall. I am, more often than not, totally anxiety-ridden. I don’t know what it’s like to be totally relaxed, and I’m not sure I have ever known. When I was a kid I worried about always being the new kid, if I was ever going to fit in, if I was ever going to have real friends who’d hang on even if we had to move again. And so I worried about my clothes and my interests and my speech, because I worried all the time about being liked. But, I’m learning to put that to death, to be new, to worry less. It’s hard but good work, and I like the person this work is shaping me into. I like the way it’s deepening my relationship with God, and the way it’s giving my faith some real maturity. And I like the ways that my friends are responding to this me that is more comfortable in my skin, when that skin is less polished and a little raw. So, this is my new mantra: Worry less. And with that, it is a challenge to myself in all the best ways to give myself a little credit, to extend myself a little grace, to trust the person that is exactly who God created me to be. And it is a challenge to my community, to my friends, to love me even when I may not listen to them and may do my own thing. Sometimes, believe it or not, worrying less is exactly the right thing.